Earlier this year I took a look at the inaugural edition of an academic journal devoted to studying the philosophy and theory of metal. I promised to return to one particular article, “Determinants of the Production of Heavy Metal Music,” because it discusses something I’ve thought about but couldn’t narrow down enough to figure out how I would approach writing about it: The demographic and economic factors that account for why some countries have so many metal bands and others don’t. I had a vague shape of this in my head, but couldn’t figure out how I would be able to analyze various countries in terms of the types and numbers of bands they produced, such as death metal in poor Catholic countries and black metal in wealthier European countries. I was thinking in terms of religion and economics, population size and density. As soon as I said I was interested in this article I knew it would never happen. It seemed too big, too scholarly. I knew there was something to it, but where do you start? Especially for someone who’s not a scholar. 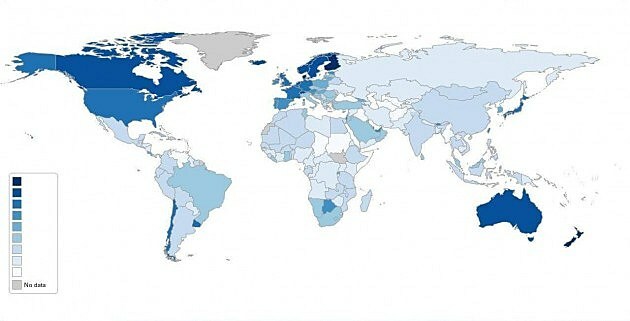 It’s common enough knowledge that more metal comes from Scandinavia than anywhere else [see the above photo by Business Insider], but what about the rest of the world? The researcher behind “Determinants” did something pretty close to what I had in mind. Donald Maguire analyzed 55 independent variables to determine which ones relate to the formation of metal bands. Turns out I was right to connect Catholicism with population density factors. We can break these variable down a bit. Three relate to religion (percentage of the population that was Catholic in 2010, the percentage of the population that claimed no religion, and the number of years of Marxist legal history). One variable, the number of concert halls per 1 million people, relates to the availability of resources, while another, males aged 15–24 as a percentage of the total population, is a demographic variable. To find these seven reasons why some countries make more metal, Maguire took social, geographic and demographic variables that in 2012 were publicly available to anyone with a web browser and access to a university library and used regression analysis, a statistical process for finding relationships among variables. A variable was considered to be a “robust determinant” (i.e., highly influential) if it had a t-score greater than or equal to 2, and a precision of less than or equal to 0.05. (In statistics, the t-value is a measure that determines if the results are statistically significant . . ., meaning it’s a result or relationship caused by something other than mere random chance.) As each regression was run, the variables that were shown to have the least importance were eliminated. 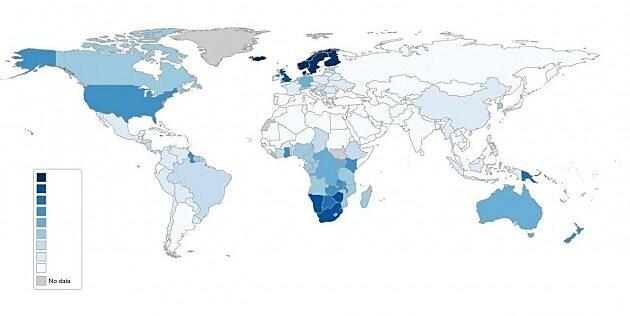 When Maguire looked at the predicted number of metal bands per 100,000 people (using info from Encyclopaedia Metallum), two countries, Scandinavia and Japan, introduced significant outlying data points. The difference in the precision for Japan came about because Encyclopaedia Metallum didn’t include a genre called Visual Kei in its results. A large amount of the standard error came from Scandinavia, because apparently, “musicians in Finland and Sweden are known to often be in more than one band.” So, because of these issues, one regression was conducted without including Japan and Scandinavia. The other variables aren’t given quite as much explanation as I’d like, but this article is a statistical analysis and not an anthropological study. Maguire tells only that “the number of years of any form of socialism was the only alternative that was strong enough for consideration,” but does not explain why. Maguire also states that the further a country is from the equator the more bands it produces, but we’re not given much explanation for why that is either, besides the reasoning that equatorial populations are too busy fighting off parasites, diseases and heat exhaustion to produce much metal [or music in general]. Whether or not a country had a Scandinavian legal history was considered an important variable because it affected the perceived level of political corruption in the country. Apparently the Scandinavian legal code is purposely incomplete. “In other words, Scandinavian Law is constructed to hold people accountable to the spirit of the law and not merely the letter of the law,” he says. It’s not clear how this relates to heavy metal exactly, except that it seems to engender a “do as thou wilt” philosophy that allows metal to prosper. Obviously, the amount of concert halls matters because that relates to the ability of musicians to perform. This also relates to the support that the country’s population shows for metal performances. Surprisingly, though, there was a negative relationship between the number of heavy metal bands per 100,000 people and the percentage of the population that is male and between the ages of 15 and 24. This means that as a country had more metal bands per 100,000 people, that same country had less males between the ages of 15 and 24. Seem counter-intuitive? It does to me, and the author thought so too. He says the inverse statistical relationship between the number of bands and the number of young males is “very strong,” and he also says that his analysis alone is not enough to explain this. Maguire surmises that there might be a change in musical tastes in males between the ages of 15 and 24 which makes them less interested in heavy metal, or that when males of that age are a low percentage of the population they turn to music to give them a louder voice in society. Perhaps when males of that age are a larger percentage of the population they have to compete more often in the social realm and may have to avoid metal in exchange for societal acceptance. Perhaps further studies will answer these questions. In the meantime, download the article here. A second issue was released in April 2015. This one’s not free like the first issue was, but you can download the abstracts here. Is Metal Smarter Than a 5th Grader?